A few years ago, when the borough was building the new bridge and the new section of Bainbridge Street, the excavation turned up some millstones at the site. Rather than discard them, the borough decided to incorporate them into the design of the intersection. It really turned into a nice spot for downtown. Because they were an unexpected discovery, the borough didn't have any money budgeted to add any historical information about the millstones. This year, that finally happened -- along with the borough's receiving a Lancaster County Urban Enhancement Fund grant awarded by the Lancaster County Commissioners and Lancaster County Planning Commission. The plaza was designed by Derck & Edson Associates. And thanks to Jeff Kinsey, who is the borough's assistant director of public works, and his dad, Robert, historical markers have been prepared. The Kinseys spent their free time researching the millstones and the mill that was on the site. They worked with local historians Patsy and Lloyd Reed and Nancy Groff to research and compile the history of the grist mill that once stood there. Patsy Kline also provided a graphic depiction of a typical grist mill of the era. 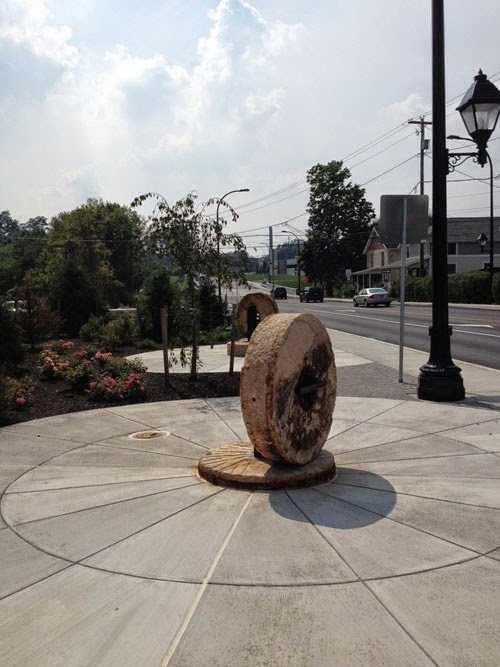 At 3:30 p.m. on Thursday, April 17, the borough will hold a ceremony to acknowledge the completion of Millstone Plaza, including the construction of decorative walls and pavers, display of unearthed mill stones, and most recently, the installation of interpretive history signage. The public is invited to attend the ceremony.